Beginning from Windows 10 Build 10565 (somewhere between Windows 10 RTM and Windows 10 November 1511 Update, which means if you upgraded to Build 10586, you’re affected), the Favorites in Microsoft Edge storage location are now in an ESE database file instead of the a Favorites folder. The changes make it impossible to manage, change, add, delete, import, export, backup, restore, save or delete favorites by using just Windows Explorer or File Explorer, as now all favorites are stored in encrypted database, instead of individual .lnk link. 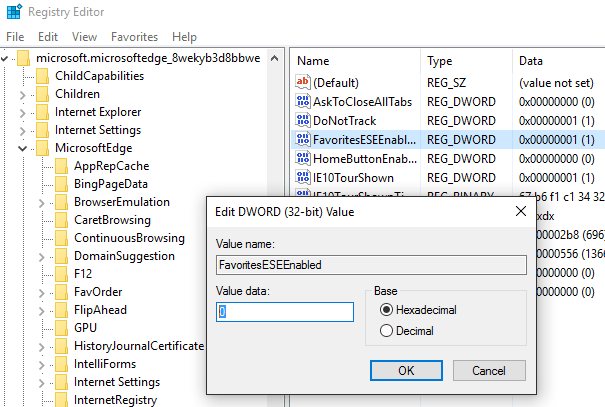 Microsoft provides an option to change the storage location of Microsoft Edge favorites in the new ESE database file or old legacy Favorites folder location for your account, through registry key. This tutorial guides you on how to perform the change to where to store the Favorites of Edge browser. Quit all Edge browser window. Change the value data for FavoritesESEEnabled to either 0 or 1 according to your preference. Done. You can now exit from Registry Editor and start Edge. If you’re switching to save Edge Favorites in ESE database, the legacy bookmark folders to save Edge Favorites à la IE is no longer in use, and can be safely removed and deleted (just make sure you have all favorites and bookmarks appear in the Edge browser. It’s also true vice versa. Download the registry registration entries file (extract from ZIP) below to change the setting for storage location of Favorites in Edge web browser directly. If you change to use legacy Favorites folder storage location, the bookmark synchronization feature of Edge will not be working.